Semiconductor physics, quantum electronics and optoelectronics, 20 (1), P. 001-018 (2017). Semiconductor physics, quantum electronics and optoelectronics, 20 (1), P. 019-025 (2017). Semiconductor physics, quantum electronics and optoelectronics, 20 (1), P. 026-033 (2017). Semiconductor physics, quantum electronics and optoelectronics, 20 (1), P. 034-040 (2017). Semiconductor physics, quantum electronics and optoelectronics, 20 (1), P. 041-047 (2017). Semiconductor physics, quantum electronics and optoelectronics, 20 (1), P. 048-054 (2017). Semiconductor physics, quantum electronics and optoelectronics, 20 (1), P. 055-063 (2017). Semiconductor physics, quantum electronics and optoelectronics, 20 (1), P. 064-068 (2017). Semiconductor physics, quantum electronics and optoelectronics, 20 (1), P. 069-073 (2017). Semiconductor physics, quantum electronics and optoelectronics, 20 (1), P. 074-078 (2017). Semiconductor physics, quantum electronics and optoelectronics, 20 (1), P. 079-084 (2017). Semiconductor physics, quantum electronics and optoelectronics, 20 (1), P. 085-090 (2017). Semiconductor physics, quantum electronics and optoelectronics, 20 (1), P. 091-095 (2017). Semiconductor physics, quantum electronics and optoelectronics, 20 (1), P. 096-104 (2017). The paper was withdrawn in accord with the Editorial Board decision. Semiconductor physics, quantum electronics and optoelectronics, 20 (1), P. 105-109 (2017). Semiconductor physics, quantum electronics and optoelectronics, 20 (1), P. 110-117 (2017). The paper was retracted in accord with the Editorial Board decision. Semiconductor physics, quantum electronics and optoelectronics, 20 (1), P. 118-122 (2017). Semiconductor physics, quantum electronics and optoelectronics, 20 (1), P. 123-128 (2017). Semiconductor physics, quantum electronics and optoelectronics, 20 (1), P. 129-136 (2017). Semiconductor physics, quantum electronics and optoelectronics, 20 (1), P. 137-141 (2017). Semiconductor physics, quantum electronics and optoelectronics, 20 (1), P. 142-148 (2017). 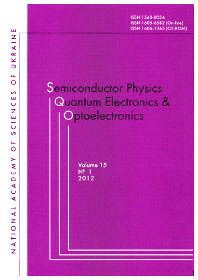 The Editorial board conducted its own inspection of articles published in the journal of Semiconductor physics, quantum electronics and optoelectronics N.4 (Vol.19) 2016, N.1 (Vol.20) 2017 and found articles published with infringements of Publication Ethics and Publication Malpractice Statement. The Editorial board based on inspection decided to retract articles with infringements of Publication Ethics and Publication Malpractice Statement.